Trevor Danks' memories of RAF Merryfield. At the end of January 1956 I arrived with two other guys at Merryfield. One of the other guys was an officer who had just completed flying training and had decided he did not want to fly so he was sent to Merryfield as an air traffic controller. 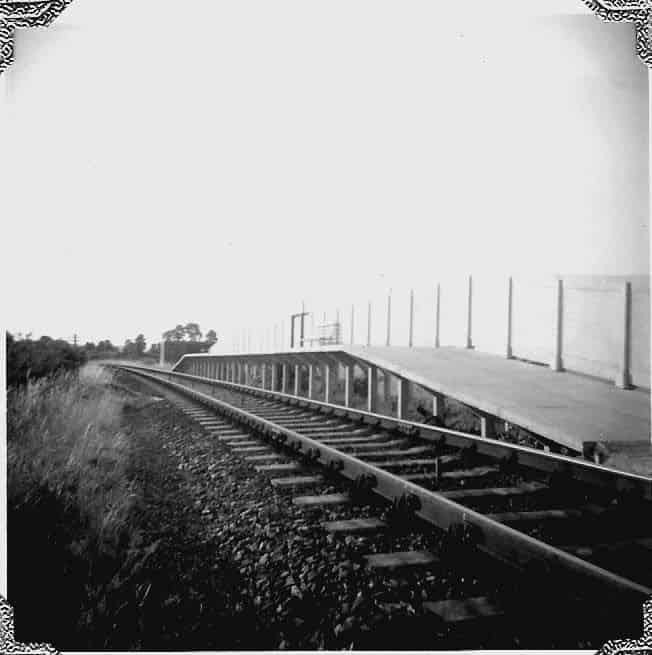 Merryfield is near a village named Ilton and there was a railway station of sorts, this was the proverbial two planks on the line. It was a single line with just a raised platform no ticket office. To travel to Taunton the system was you got on the train known as the “Ilton Flyer” and got off at the next station ( Hatch Beauchamp I believe), to book your ticket. RAF personnel could travel by train at two thirds of the normal price. From Taunton to Birmingham it was a £1.00. At the time I was earning 28 shillings ( £1 - 8s ) per week that is £1.40 in today’s coinage. 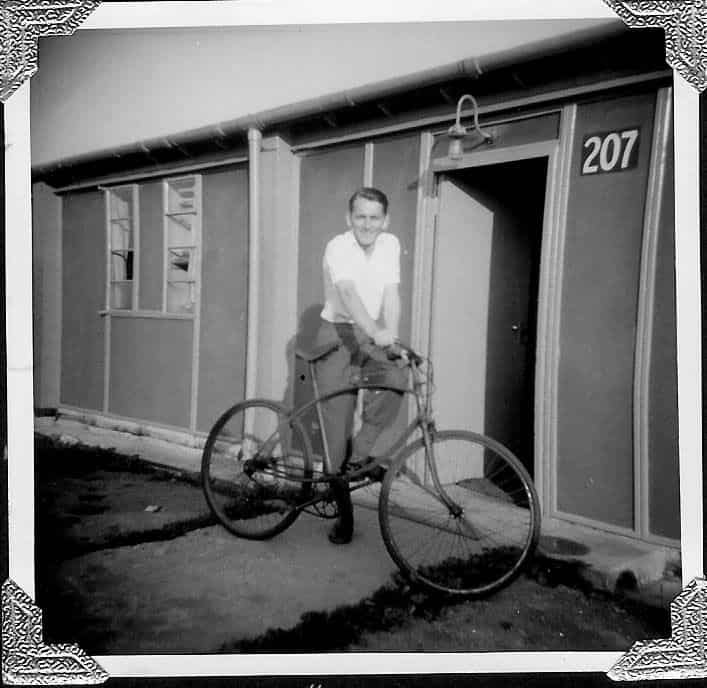 While I was at Merryfield I purchased a bike from an Army & Navy Stores. This bike could be folded. RAF Merryfield was an OCU Operational Conversion Unit the squadron was No.231OCU. 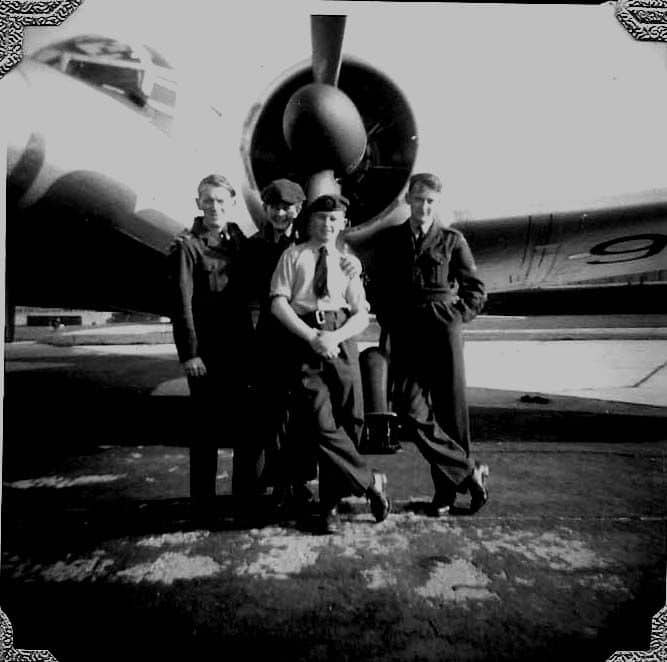 It had Meteor and Canberra aircraft and trained newly qualified pilots and aircrew in photographic reconnaissance. The Meteor flight had single seater Meteor PR3 and two seater T3 trainers, known affectionately as “ Meatboxes “ the Canberra flight had Canberra T4 and PR4 aircraft. I joined the Meteor flight. 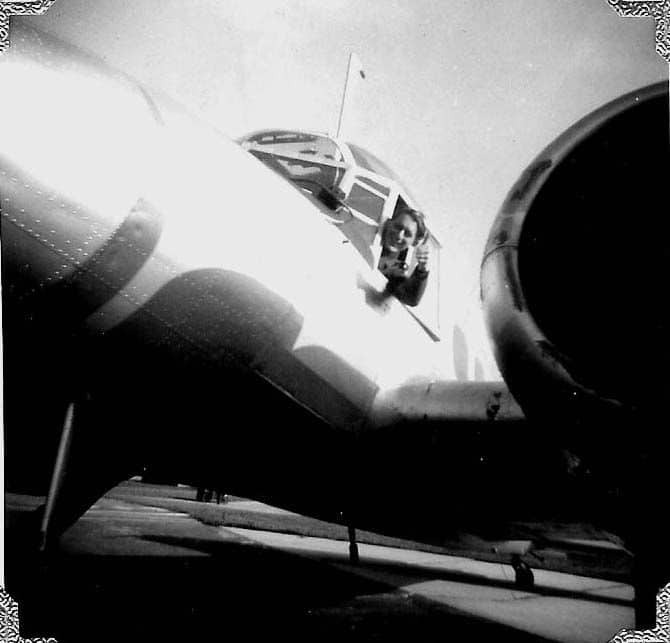 As a new posting I was attached to an experienced airframe mechanic whose name was Bob Ridley. I just had to follow him around and generally assist as and when required. 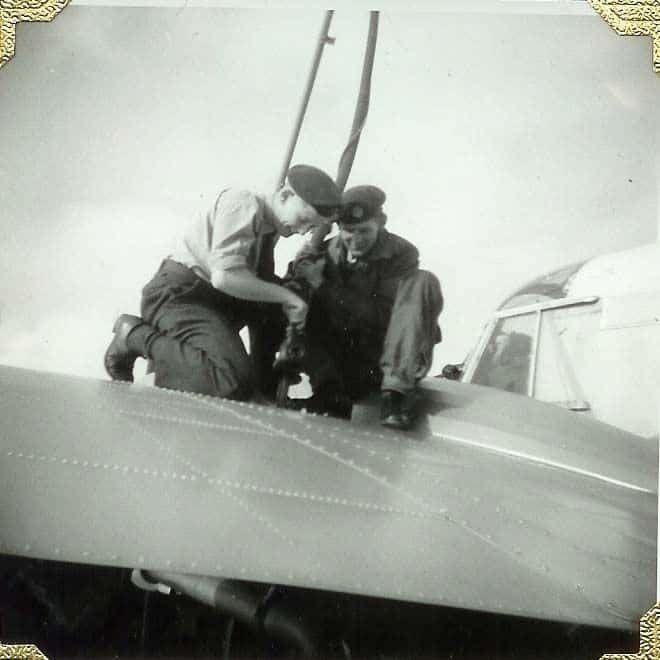 I could not carry out inspections unsupervised until I was a LAC (Leading Aircraftsman). I quickly made my name when assisting with the removal and replacement of a nose wheel on a Meteor. I was given the task of refitting the mudguard and while tightening the bolt, which went into the Oleo leg, it snapped off leaving the shank in the leg. I was very popular, as we then had to totally dismantle the nose wheel undercarriage to drill out the shank of the bolt. This put the aircraft as unserviceable for a day, meaning it could not fly. When assisting anyone later the usual comment was “ Watch out for him, he does not know his own strength !” However it did not delay the opportunity to take the test for my LAC which I passed. After a few weeks I discovered there was the occasional opportunity to get a flight in a Meteor T3 and so I mentioned to Bob Ridley that if the chance arose I would not mind a flight. A few weeks later he came up to me and told me to report to the flight crew office, as there was a trip available. I eagerly arrived there to be fitted out with an overall and a parachute. When we arrived at the plane there were my grinning friends enquiring if I needed spew bags, which I declined, whereupon the pilot shoved them in my hand and said “ Take em !” The pilot was our flight commander who was keeping up his hours. The pilots had to do so many hours per month to continue flying. It was my first trip in a jet plane particularly a jetfighter even if it was only a trainer. When he opened up the throttle it was as if a big hand was pushing in the middle of my back as we hurtled down the runway. He pulled back on the joystick and we went up near vertical. He levelled out at 10,000 feet, as I could not go above that height even though we had oxygen. I later learned you could not go above 10,000 feet without first having a decompression test in a decompression chamber. Well he stooged about for something like 30 minutes at one time going into a dive then pulling up into a climb, it was all very exhilarating and came to end far too quickly for me. Fortunately I did not need the spew bags. It was my only flight whilst at Merryfield as they were very much in demand. Some people did need the spew bags, I remember one occasion when a rather bumptious corporal from one of the administration offices got himself a flight and when asked to take spew bags scornfully threw them a side. When they returned a colleague of mine Bruce Garner opened the canopy to see this rather green faced corporal who then proceeded to hand him a glove with an evil smell coming from it. Bruce recoiled from the offer and told him in no uncertain terms to get rid of it himself and to come back to clean up the mess in the cockpit. It turned out that with the pilot doing a few manoeuvres the corporal felt rather ill and the only thing available to be sick in was one of the pilot’s gloves about which he was not amused. A further point relating to my flight in a meteor came from reading a piece out of the web page by Ralph Swift on Jet training at Merryfield. He told of the difficulty of getting out of a Vampire prior to having ejection seats. I remember when I was about to climb into the back seat of the Meteor trainer the pilot gave me one or two details which he felt I ought to know about. He ended this by saying "Oh! By the way if we have to get out you need to do the following". I will jettison the canopy. You then can unfasten your seat harness stand up on the seat and then dive over the side so that you miss the tail plane. Got that! I timidly replied "Yes Sir". Reflecting on this required course of action, the thought of trying to do all of that with the aircraft probably out of control with it either diving or spinning or possibly both, the prospect even today scares the pants off me. Yet on the day with the excitment of the moment I never gave it a second thought. Being a small squadron we did all the work on the aircraft. This fell into two categories, first and second line servicing, there was a third line servicing which usually meant the aircraft going to an MU Maintenance Unit such as RAF St Athan, near Cardiff. First line servicing was done every time an aircraft flew which consisted of a number of checks on the airframe, tyres, pneumatics and hydraulics and securing or setting the ejection seat ready for activation. This consisted of fitting or removing a safety pin. If the aircraft flew or not they were serviced every 72 hours which usually consisted of a more intensive check in particular running the engines. We also were required to marshal the aircraft on leaving for a sortie and again on their return. Marshalling consisted of making sure the plane was clear of all obstacles as he left the parking area out to the perimeter track where it became the responsibility of the pilot. On his return someone would stand out on the perimeter track to indicate where the pilot had to exit for the parking area. A second guy would stand at the place where the plane was to be parked, he would wait until the first guy handed over to him and he would then stand with his arms held out to form a letter Y. He would then manoeuvre the pilot to the required parking spot by moving his left arm to tell him to go left or the right arm to go right, both arms moving in unison backwards and forwards towards the body meant come forward in a straight line. The steering of a Meteor consisted of the pilot operating his foot brakes on the rudder pedals. It was the only time you could tell the pilot what to do. There could be moments of excitement such as if you had a novice pilot fresh from flying training. If the pilot did not get the engine start procedure quite right you would have what was known as a “wet start “. If you had one of these the procedure was to run the engine cold to blow out the excess fuel and retry. However some bright sparks would press the re-light button on the throttle which if it worked usually created a flame with a loud whoosh out of the rear end of the jet pipe. If and when this happened to a novice pilot the expression on their faces was a picture as they were fastened in and it looked as if the plane was about to go up in smoke. In the Summer it was very pleasant out on the airfield in that we would sunbathe while waiting for the planes to return. 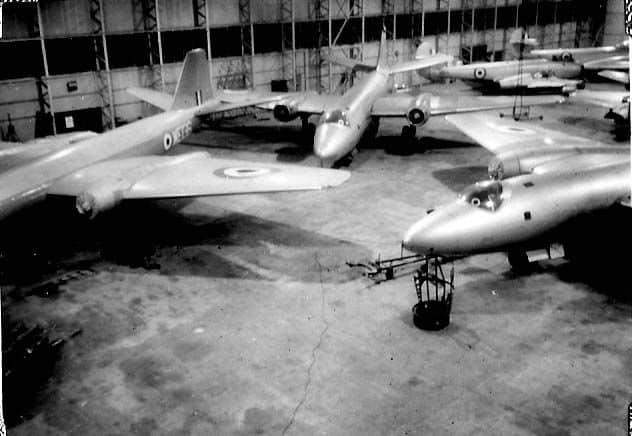 At times there would be a distraction in that there was a hangar on the other side of the airfield which was occupied by a test flight from Westland and they had a Canberra which would go off on a test flight some days. On it’s return the pilot would occasionally beat up the airfield. He would come in very, very low and as he came to the centre of the airfield would just go up vertically or on other occasions do a roll across the airfield. Everyone would give him a cheer and a wave in appreciation as he taxied past following his landing. On another occasion we had a flight of six Hunters come in on a diversion, as they were low on fuel. They did a “peel off” landing whereby each one peels off in sequence so that they go round and land one after the other. The last one left it a bit late and so was trailing behind the others, when he realised this he tried to catch up but this meant that as he got to the runway he was going too fast and not wanting to go round again hit the runway about a third of the way along. He then realised he was not going to stop at the end of the runway and slammed on his brakes bursting a tyre on the starboard side and so the plane shot off to the right onto the grass towards the perimeter track around which were the other Hunters were taxiing. He sped across the grass until he hit the perimeter track concrete whereby the undercarriage snapped off with him hurtling towards the last Hunter in the line. Fortunately he just missed it and the belly flopped on to the grass and into a hedge. In the meantime the fire wagons were chasing him across the airfield, fortunately the plane did not catch fire. However we were told later that as the fire crew got to the plane this rather ashen faced young pilot sat rigid in the cockpit and literally had to be prised free. 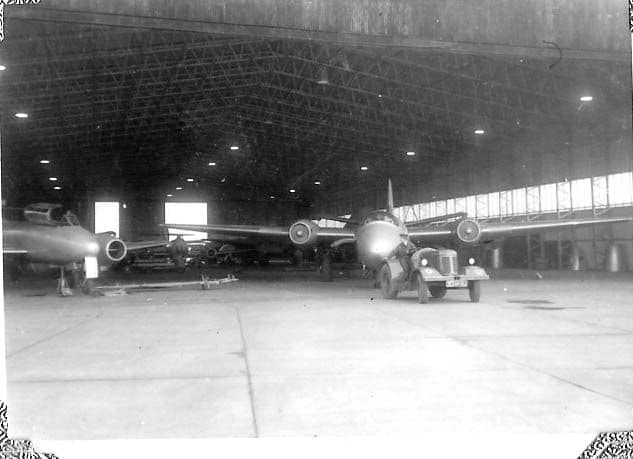 That Hunter was in our reserve hangar for six months while some guys from St Athan rebuilt it. The Hunter at the time was the most modern fighter in the RAF and so some of the ground crew took the opportunity to take photographs, which if they had been caught would have meant at least being on a charge if not worse as they were top secret. The day I took my exams for SAC I had a very narrow escape. The exam was timed for late morning and first thing I was given the job of carrying out an Intermediate service on a Meteor. Part of this entailed checking the level in the hydraulic reservoir. However the procedure involved checking the level prior to an engine run and then again following the engine run. This all had to be done with the reservoir filler cap removed. Unfortunately the engine fitter who was to run the engines was working on other aircraft and could not get the one I was working on before I left to take the exam. When it came time to leave for the exam I signed the Form 700 to show the inspection had been carried out and I asked the engine mechanic who would be helping the engine fitter with the engine run to replace the filler cap afterwards. 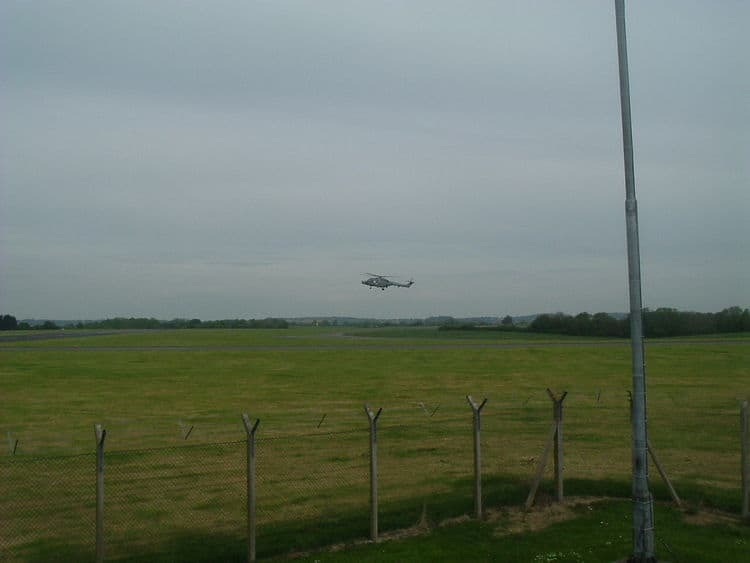 I did my exam and returned in time to see the aircraft return from an exercise. After the pilot had got out the cockpit I climbed in to put the safety pin in the ejector seat. To do this you knelt on the seat and faced the rear of the aircraft. As I was putting in the pin I noticed the filler cap still sitting on the surface behind the seat under which was the hydraulic reservoir. I quickly screwed it back in and could only think that the pilot had flown straight and level throughout the flight. I could only think that the engine guys had completely forgotten the filler cap. If he had found that during his pre-flight inspection or something happen during the flight I would have been up on a serious charge which could have resulted in at least fourteen days in the Glasshouse. (Prison). I still go cold at the thought of it. 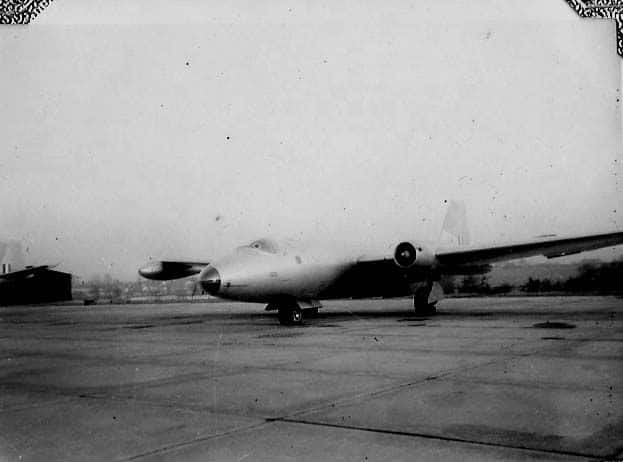 One Canberra we had on the flight was the one used in the London to Christchurch, New Zealand air race in 1953. It was painted PR blue and had printed on its nose London to Christchurch 23 hours 34 minutes. The Canberra is now in the RAF museum at Hendon. Our Commanding Officer was a Wing Commander who we were convinced was trying to get Group Captain in that he had a parade every Saturday morning. You were only excused the parade if you were on other duties or had been on night flying the night before. So most Friday nights were spent bulling your kit ready for the parade next morning. It was only after the parade was over that we could leave for our weekend pass. In the 10 months I was at Merryfield I am pretty sure I got home every weekend, somehow miraculously avoiding guard or fire picket duties. There was about 5 or 6 of us who travelled regularly to Birmingham and back. Early in the year we travelled mainly by train but later on one of the guys, Nobby Clarke, bought a car. Anson maintenance. Me (1st left) with mates Pete, Bill and Clive. "Contact"
A flight of fancy with me in the Anson. We had many escapades travelling by train. We used to catch the train at New Street Station, Birmingham around midnight which got us to Bristol in the early hours of the morning and then we caught a train to Taunton, which arrived about 4am. We then had to wait for the Hilton Flyer at 6am, which got us back to camp at about 6.45am whereby we had a quick breakfast to be up at the flight office for 7.30am. That is if everything went according to plan, but oh boy the times it went wrong. Of course the other thing was that you did not have any sleep Sunday night so Monday used to be torment with us going about like zombies and followed by an early night if possible. We continued to travel each weekend for quite a period until just before we all were posted from Merryfield. However the final journey ended in a way we had all got used to, the car broke down at a place named Wychbold near to Bromsgrove. No one could figure what was wrong as we stood there looking under the bonnet. Then along comes a guy in another American car, a Hudson. He pulled over seeing the Buick and asked if he could help. He quickly came to the conclusion it needed the attention of a garage. He said all he could do was to offer us a tow into Birmingham, which we gladly accepted. So the final journey home with the Buick was being towed by a Hudson, it made quite a sight. Not long after this we learned that the Royal Navy was to take over at Merryfield while work was carried out on the runway at RNAS Yeovilton for the delivery of Sea Vixens. The squadron was to move to RAF Wyton near Huntingdon. However I took the opportunity to ask for a posting nearer to home and after two weeks of being attached to the Navy I was posted to RAF Gaydon near Leamington Spa. In 2002 I was working as a clerk to a school inspection team when I visited a school in Devon. On the way home along the M5 I made a detour at Taunton to find the village of Ilton just to see what had changed in the ensuing years. The village did not appear much different except that there were new houses and bungalows about. 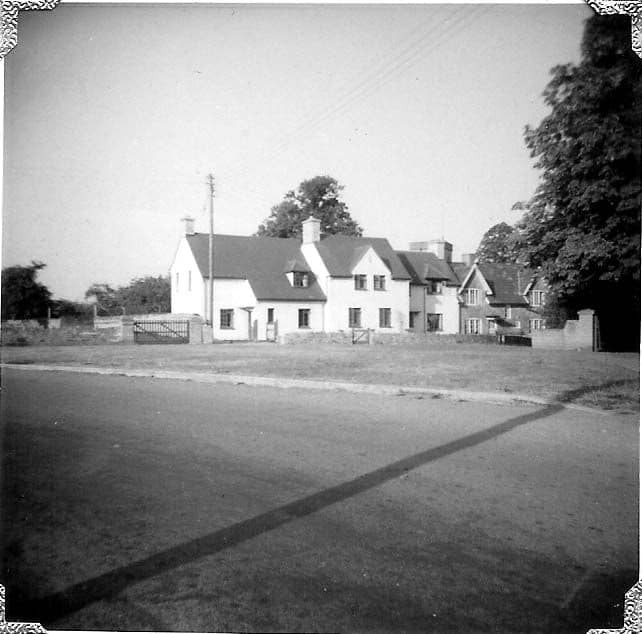 The pub and village shop were still the same and then I noticed the lane which used to lead to the airfield. I drove down the lane and saw a small industrial estate, just past this I saw what used to be the entrance to the airfield and where the guard doom had been, all now gone, there was a rickety fence across the entrance. I decided to drive on further to where the end of the runway used to be so I could look across the airfield. As I went round a bend there in front of me was an entrance with a notice saying “Royal Naval Air Station Merryfield”. I was amazed that after all those years it was still an operational station. I drove in and there was barrier and a small security hut out of which emerged a security guy. He asked what I wanted and I told him that I had been stationed there in 1955. Being some 30 or 40 years younger than me he looked at me with an expression of great surprise but with a deal of pleasure. He told me it was a pity but the CO was away as he would have liked to have met me as he always wished to meet anyone associated with Merryfield. The station now operated as a satellite of RNAS Yeovilton and there were helicopters practising take-off and landings. We chatted for some time about the airfield and what had happened over the years. I came away quite pleased to think it was still in use. I have included this picture of me now so you can see what the ravages of time have done. The photo shows me (on the left) presenting a picture done in Pyrography by our son Philip. I am presenting it to Jack Holmes the Chief Engineer at the Boulton Paul Museum in Wolverhampton. The picture depicts the action of the crew of a Boulton Paul Defiant shooting down a Heinkel 111 during the Battle of Britain. The framed picture I am holding is the account of the action by F/O Desmond Hughes and his airgunner Sgt. Fred Gash. We are standing in front of a full size replica of a Defiant built by Jack and his team of volunteers. My interest in this is that I worked at Boulton Paul Aircraft for a short while when I came out of the RAF in 1957. I received the following e-mail from Trevor Danks at the beginning of 2013 and thought that this would be a good place to add it. A few years ago my wife and I were on holiday in Devon and asked if we could visit RNAS Merryfield just to have a look. However we received an e-mail to invite us to visit at 9.30am to meet with a Lt Stringer. On arrival we were instructed to drive to the control tower where we were met by the said Lt Stringer. There we met a guy, Mac Hawkins, who I had been corresponding with about Merryfield. We discovered that his daughter was a Lt Cmdr at RNAS Yeovilton and on hearing of the fact that I was once stationed at Merryfield and my desire to visit there arranged for us to have a full day there. Following coffee and a visit to the photo history collection in the Tower we were given a tour of the airfield. The airfield is now used for the operational training of Royal Navy helicopter pilots and so there was flying training taking place. We were given a demonstration by the station Fire Service of tackling a crash fire and rescue procedure. (See attached photos). On our return to the Tower Mac and I went onto the balcony where a Lynx helicopter came up behind us to have our photograph taken. As a nice touch the helicopter bowed to us. (See attached photo). We then were taken to RNAS Yeovilton for lunch in the Officers Mess after which my Wife and I were taken to the Fleet Air Arm Museum. We spent the afternoon in this absolutely splendid Museum were you could experience life aboard an Aircraft Carrier. Merryfield is now devoid of all buildings except for the Control Tower.